NHMU volunteer Elliott Smith in the quarry where parts of the most complete tyrranosaur ever found in the Southwestern U.S. were ready for transport. Photo © NHMU by Jim Breitinger. On October 15, 2017, a momentous event occurred at Grand Staircase-Escalante National Monument. After 76 million years, a nearly intact skeleton of a tyrannosaur was airlifted out of its resting place. And what a resting place it was. After a journey through time at a place where so much had happened, we are lucky to be alive when a piece of its skeleton was poking through the surface and a Utah-based paleontologist came across it. The paleontologist is Alan Titus of the Bureau of Land Management, the federal agency that manages the monument. 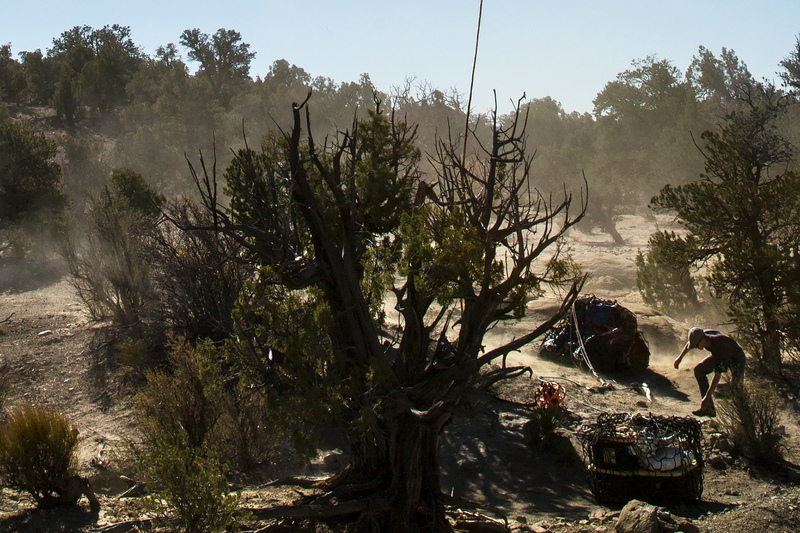 Titus regularly collaborates with Natural History Museum of Utah (NHMU) paleontologists on fieldwork and research. They worked together to excavate this new find and then do further work at the Museum. NHMU paleontologist Tylor Birthisel led the field team this summer and fall. On average, the team consisted of 8-10 people over five non-contiguous weeks this year. That morning I hiked in with two NHMU paleontology volunteers: Elliott Smith and Cody Rock. We parked on a remote dirt road and hiked the final couple of miles to the small quarry where the tyrannosaur was found. It was a cold October morning. The temperature dropped to 19 degrees fahrenheit overnight. But with the sun up it was rapidly warming to the day’s high of about 55 degrees. After our hike to the quarry, we began our wait for the helicopter that was due to arrive. Why do I describe the lifting of a tyrannosaur as a momentous event? Well, consider what happened in the last 76 million years. During its life in the Late Cretaceous Epoch, the tyrannosaur lived on the eastern edge of a continent called Laramidia which was a large north-south island. This eastern side of Laramidia was on the coast of a shallow sea that split today’s North America; this inland sea connected the Arctic Ocean with the Gulf of Mexico, and stretched east past the location of the Mississippi River today. Laramidia’s western boundary corresponded mostly with the current western boundary of North America. The island stretched north to Alaska and Canada’s Yukon Territory, and south into today’s southern Mexico. In its lifetime, our tyrannosaur lived in a humid sub-tropical environment similar to the modern-day bayous of southern Louisiana. The poor animal died, as we all must, and began its almost incomprehensible journey through time. After its death on what was a coastal floodplain, thousands of feet of sediment were deposited by rivers and streams on top of the grave with the first 1,200 feet or so deposited within about a million years. Bryce Canyon National Park, with its orange spires, lies just to the east and gives a good visual example of what remains of additional sedimentary deposits from between 55 and 45 million years ago. To this day, Bryce towers as high as 3,000 feet over the tyrannosaur’s grave. During the following millions of years, a combination of erosion and uplift took place at this grave site. Initially at sea level, tectonic processes lifted what is now the Kaiparowits Plateau 6,000 feet to where in 2015 Alan Titus found the site. While this is an incomplete geologic history, the three of us felt a strong connection to the deep time associated with this tyrannosaur, and the journey it has endured as we waited for the helicopters. Elliiott braves the blast of wind from the helicopter as he hooks a field jacket up for transport. Photo © NHMU by Jim Breitinger. Breaking over the horizon first one, and then two choppers came toward us. One had a long rope dangling below it, and the other had KSL emblazoned on its side. Our adventure was going to be in the news. There is nothing stealthy about a helicopter. The quiet and contemplative morning on the Kaiparowits Plateau came to an end as these man-made birds roared our way. The chopper that was there to do the heavy lifting circled first then lowered directly over our heads as the pilot began the first of four trips to trucks that were about five miles away. As the chopper bore down on us, the desert sand started flying. Our hats blew off and we couldn’t hear our own thoughts. Elliott and Cody took turns doing the honor of connecting cargo nets containing the prepared field jackets protecting the bones. 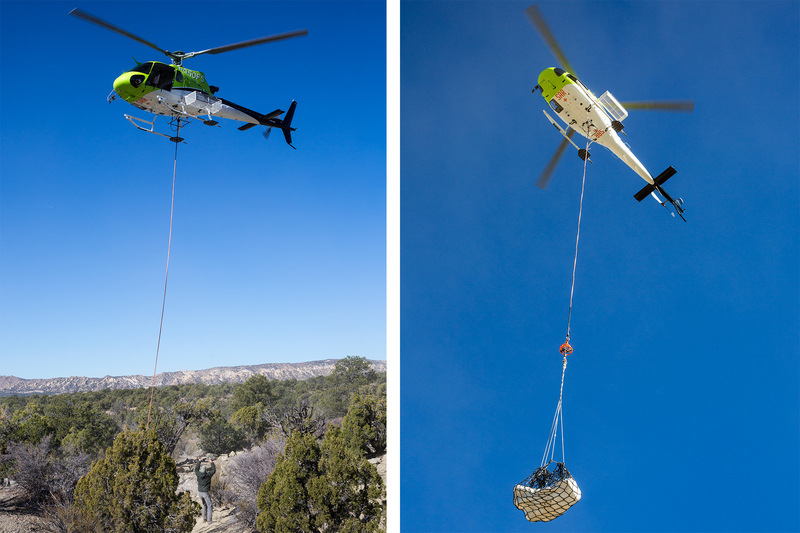 After securing the connection, we gave the signal and the helicopter slowly began lifting its heavy load. It rose farther and then floated away on the short taxi to the trucks. After each lift the three of us were giddy, whooping and hollering. It was a rush. Photos © NHMU by Jim Breitinger. And what a moment. The fossilized remains of this animal, which we think is at least 80% complete and in life position, was beginning a new adventure into the world of modern science where it will add to our knowledge of the long history of life on our planet. This is the most complete tyrannosaur ever found in the Southwestern United States. We were thrilled to be there as this animal rose to the sky and headed to its new home at the Museum where it will be studied by paleontologists and appreciated by the public for many years to come. For me, it was an honor to witness the work that my colleagues--including our many dedicated volunteers--do with such professional dedication. Jim Breitinger has a master’s degree in environmental history and is the director of marketing at the Natural History Museum of Utah in Salt Lake City. Our mission is to illuminate the natural world and the place of humans within it. In addition to housing outstanding exhibits for the public, NHMU is a research museum. Learn more.